If you are considering professional Huntsville hardscaping then you have come to the right place. For close to a decade now, our team has been the one to trust in for this and any worked related to expert landscaping. The trend for spending more time outdoors entertaining is only continuing to grow. 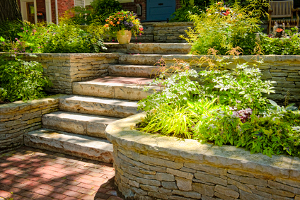 Whether you are looking for a private retreat or a multi-use gathering space for family and friends, the possibilities are endless when it comes to your hardscaping. The best part is that the added advantage of this process is, once completed, this will add value to your property as well. You have a yard to enjoy, so why not take advantage of it? Stop spending all of your time indoors when you could be utilizing the outdoor space, just as much. 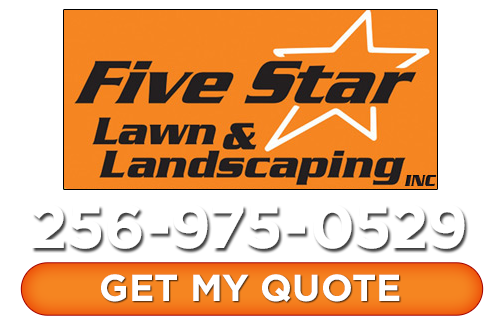 At Five Star Lawn and Landscaping, Inc. we offer a variety of stunning looks and styles that are both attractive and functional. When we meet with you we can begin to get an idea of the space we are working with and the look you are going for. From there, we can work together to devise a plan of action for transforming your yard from ordinary to extraordinary. So maybe you are new to the topic of Huntsville hardscaping. Hardscapes are features in your landscape that are flatwork or vertical elements composed of materials such as pavers, concrete, brick or stone. Put more simply, these are nonliving or man-made fixtures featured in a planned outdoor space. The more elaborate the design or plan, the more likely you are to need to have a professional take care of this for you. Another reason for working with an expert for this type of work is to carefully plan out the layout. It is about more than aesthetics; it is about making sure details like your drainage are correct. Install a hardscape feature that isn’t planned well and the lack of proper drainage could quickly destroy it. Even worse, it could send drain water towards the foundation of your home. Adding a hardscape to your property is a smart decision to make as a homeowner. But choosing to work with a reputable team of landscaping professionals like our Huntsville landscapers here at Five Star Lawn and Landscaping, Inc. is an even better idea. We look forward to showing you in person what makes us the number one company in the area to get this type of work completed. Contact us today so we can start making plans for your Huntsville hardscaping. You are going to love the new look of your great outdoors, not to mention the added property value it will bring. If you are looking for a Huntsville hardscaping expert then please call 256-975-0529 or complete our online request form.